Update: Sometimes you think a gadget is new when it was invented in the 70s as a gag gift. Sometimes you see a gadget and think simultaneously, “that’s insanely clever,” but also just “that’s insane.” The RokBlok was one of those situations for me: Who but a mad genius would have thought of a record player that propels itself along the groove like a little remote control car? That’s it in a nutshell: It’s a wireless gadget the size of a stick of butter, with a needle on the bottom and little rubber tires with which it rolls itself around the record at 45 or 33.3 laps per minute. It’s cute as a button, clever as hell and utterly absurd. First, the idea that a portable record player is really even needed is suspect to begin with. And I say this as someone who owns not one, but two portable record players. Sure, they made sense when records were the standard medium for recorded music, but when music became fundamentally portable they lost their utility (though not their retro charm). Who, I ask you, who is going to bring a selection of 45s to the park? The same ones who bring their typewriters and mustache wax, I suppose. Notably, a dozen of them pre-ordered the RokBlok while I was writing this (admittedly overlong) article. Second, people who own vinyl often do so not just out of sheer nostalgia, but because they enjoy the ritual and apparatus involved. Warm up the tube amp, wipe down the record, sit down and listen to a whole side while sipping a cup of kopi luwak. Now, the sound on this thing is going to be pretty bad. Just right off the bat, the sound waves are coming out of the precision instrument used to read them off the medium. That ain’t right. There’s a reason audio fiends isolate the turntable from the speakers and other vibrations using cork and other dampers. I don’t think the creators of the RokBlok are ignorant of this, but it remains a fundamental challenge. Also, because the speaker is going in circles, the sound is going to phase abominably. Speakers don’t spin because you don’t want to bounce the sound off every surface around you in a counter-clockwise fashion! You can, of course, hook up another, better Bluetooth speaker or headphones. But isn’t that kind of defeating the purpose of an analog source? Third, I don’t know about you, but the very idea of something riding around on top of my records, even with the softest of little rubber treads, kind of freaks me out. It’s doing 45 laps a minute! That adds up real fast! The creator told the Verge that they designed around this and that they’ve played stuff hundreds of times without problems, but what can I say, it just seems like one of those things you just don’t do. And yet I find myself wanting one. It’s not that expensive — $60 for early birds — and it’s a fun party trick, or something to have at a music store for quick listens. And really, I feel like I ought to reward the ingenuity and design sense on display here. Even if it’s totally impractical. Plus, it comes with a weird folding player that you spin manually. How can you be without such a thing? 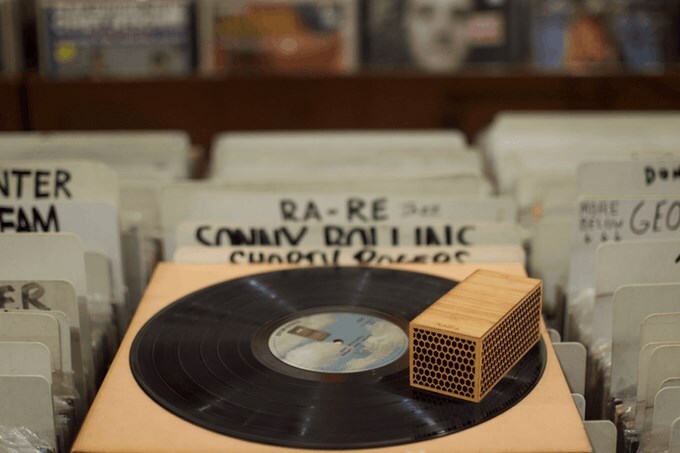 This “new spin on vinyl” is aiming for 50 grand on Kickstarter — I wish them good luck.